Was “Titans Hunt” Successful in Re-energizing the Title? Was “Titans Hunt” a Sales Success? 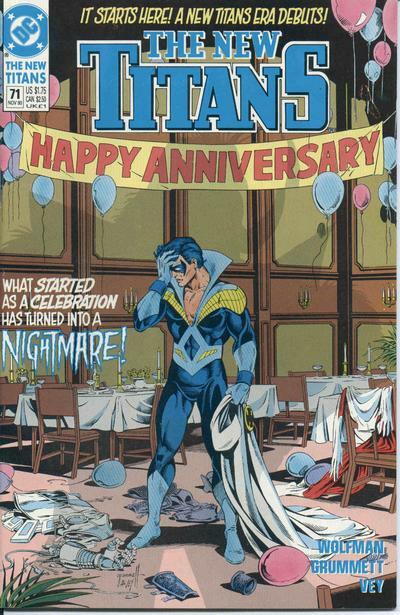 The storyline was successful in re-energizing the series by planting seeds for dozens of storylines that would play out over the next three dozen issues. It ends with a Riddler’s costume worth of question marks hanging in the air. How long will Cyborg stay a vegetable? Is Raven really dead? What’s going on with Steve Dayton? How will the inevitable battle between Donna Troy and her son play-out? Will Pantha be a good mother for Baby Wildebeest? STAR Labs honestly has no experience dealing with Atlantean biology? 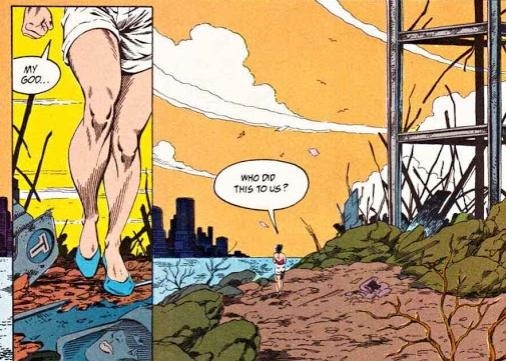 Is the Terra from the future the same Terra that betrayed the Titans and accidentally killed herself under a mountain of earth way back in 1984? Other than gutting and rebuilding of the Titans the second most important plot point in “Hunt” was the realignment of Slade Wilson (a.k.a. Deathstroke the Terminator). Wilson had already started down a path from villain toward anti-hero after the events in “The Judas Contract,” but being put into a position where he had to kill his son, Jericho, essentially cemented his place as a Titan ally. He was also a convenient already existing gun-toting character that DC could spin-off into a solo series to compete with Marvel’s two popular Punisher titles The Punisher and The Punisher: War Journal. The arc does have some rough moments, but the greatest flaw in the arc isn’t the arc itself. It’s a problem that has plagued efforts by Marvel and DC writers to tell compelling stories since Secret Wars II. The story is jarringly brought to a halt by, not one, but two DC-wide crossover events (Armageddon 2001 and War of the Gods) that occupy issues 80, 81, and the annual. 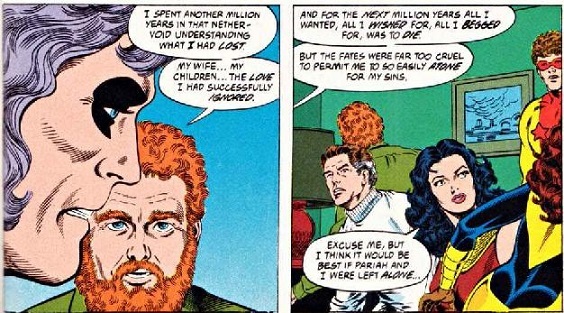 Donna Troy’s husband, Terry Long, is possibly whinier than Pariah. Of the two interruptions the War of the Gods crossover in issue 81 is the most like running into a brick wall. Here we have a rag tag group of heroes led by Terminator stopping everything that’s been building for eight issues to listen to Pariah (a character Titans writer Marv Wolfman created during Crisis on Infinite Earths) whine for 24 pages about how no matter how much he wants to die the Universe won’t allow it. If you hadn’t read any of the War of the Gods tie-ins this issue makes zero sense and does nothing to move along the overall Titans story. On the flip side, Wolfman handles the Armageddon 2001 interruption in issue 80 decently and uses it as an opportunity to set up a future storyline that will have a dramatic impact on Donna Troy. The pause is forgivable due to the significance of the developments in issue 80. If you’re only interested in the Titans Hunt story arc, skip it. If reading beyond the Titans Hunt arc is desired the best reading order is 71-79, 82-84, annual 7, 80. I can’t say for sure as individual issue sales numbers are difficult to come by in the early-90s. According to a Capital City Distribution Top 100 list from February 1992 (according to this post, Cap City at roughly 40 percent of the distribution market at the time), we know The New Titans #84, the last issue in the arc, ranked 59 in January 1992 while issue #85 dropped to 61. For Cap City, issue #85 was the 15th best-selling DC book. Sadly, that isn’t saying much. Other than several Batman titles, DC is basically shut out of the top 50 by Marvel and Dark Horse. February 1992 additionaly saw the arrival of the very first Image title, Youngblood, which debuted at a healthy number 6. It was a crazy, dire time for DC. I will hazard a guess that any bump the book received was sabotaged as DC panicked due to the Marvel X-book sales dominance and the insurgency of Image. Wolfman admits the company took at least one of his popular ideas, his Team Titans from Annual 7, and pushed him to turn them into an analog for X-Force (source). 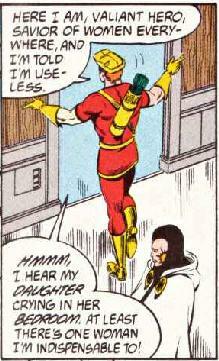 As for me, I enjoyed “Titans Hunt” upon this reread two decades later. I’d forgotten some of the cliffhangers over the years and every issue (with the exception of the crossover issues) left me wanting to jump right into the next. I’ve kept reading beyond the story arc due to an interest in seeing how some of the seeds Wolfman planted are eventually resolved. It was a commendable effort to relaunch and refresh a long running title without defaulting to the now very common Big Two tactic of rebooting a title just to get those delicious issue one sales.